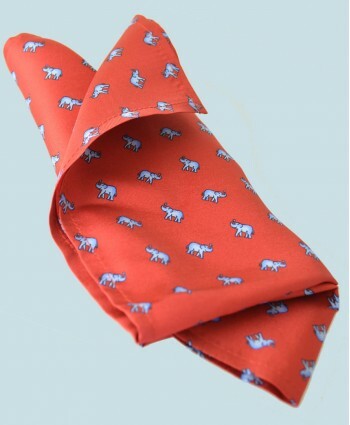 This classic silk handkerchief/ pochette features a neat pattern of light blue elephants with lucky raised trunks on a bright red background.The fine silk handkerchief/ pochette is made in England of finest quality Italian printed silk. Approx Size: 15.75” x 15.75” (40cm x 40cm) Dry Clean OnlyA donation of 10% of the purchase price of this fine silk hank/ pocket square will be made by Fort & S.. 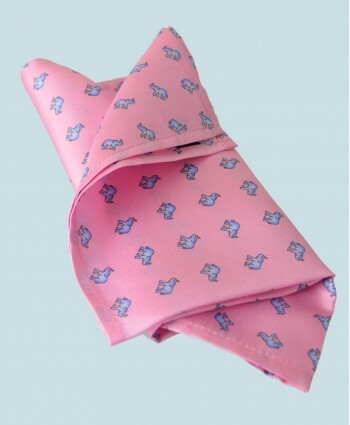 This classic silk handkerchief/ pochette features a neat pattern of light blue elephants with lucky raised trunks on a dusky pink background.The fine silk handkerchief/ pochette is made in England of finest quality Italian printed silk. Approx Size: 15.75” x 15.75” (40cm x 40cm) Dry Clean OnlyA donation of 10% of the purchase price of this fine silk hank/ pocket square will be made by Fort & S.. 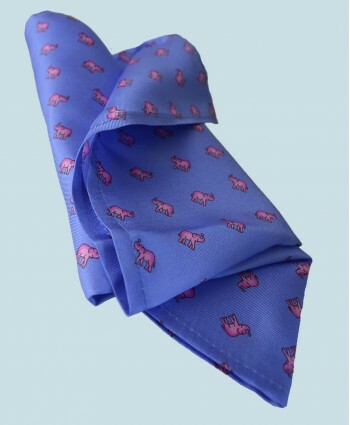 This classic silk handkerchief/ pochette features a neat pattern of rose pink elephants with lucky raised trunks on a light blue background.The fine silk handkerchief/ pochette is made in England of finest quality Italian printed silk. 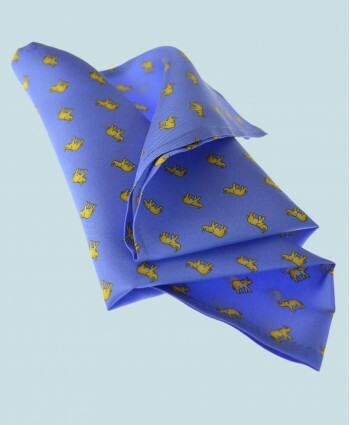 Approx Size: 15.75” x 15.75” (40cm x 40cm) Dry Clean OnlyA donation of 10% of the purchase price of this fine silk hank/ pocket square will be made by Fort & St..
Fine Silk Lucky Elephant Pattern Hank in Light Blue and YellowThe fine silk handkerchief/ pochette is made in England of finest quality Italian printed silk. Approx Size: 15.75” x 15.75” (40cm x 40cm) Dry Clean OnlyA donation of 10% of the purchase price of this fine silk hank/ pocket square will be made by Fort & Stone to support Elephant Family in their work to conserve the endangered Asian .. 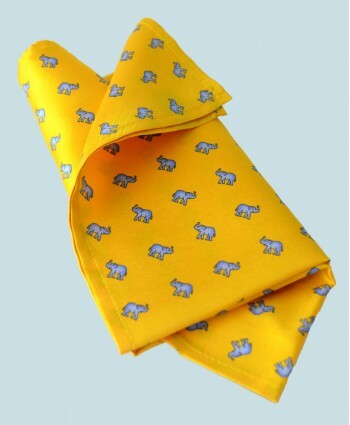 This classic silk handkerchief/ pochette features a neat pattern of light blue elephants with lucky raised trunks on a sunflower yellow background.The fine silk handkerchief/ pochette is made in England of finest quality Italian printed silk. Approx Size: 15.75” x 15.75” (40cm x 40cm) Dry Clean OnlyA donation of 10% of the purchase price of this fine silk hank/ pocket square will be made by Fort &..